The delicious candied, jellied citrus zest that is homemade marmalade isn't come by without a bit of work. Most of it is rather pleasant if you like to be in the kitchen, however, and the results are divine. Before you start, click through the steps (15 looks like a lot, we know, but we've included pictures of each and every step so you'll know what to look for along the way) to familiarize yourself with the process. If you've never canned anything before, you will also want to check out 10 steps to easy home canning. *Traditionally bitter, or Seville, oranges are used for marmalade. We find other types work fine. If you're lucky enough to have blood oranges on hand, they make beautiful marmalade! Many marmalade recipes will have you remove the peel, boil it once, twice, or three times, and then separate the tasty and colorful zest from the bitter white pith. We prefer to leave the ​pith out of the equation from the beginning. Use a sharp peeler or paring knife to carefully cut off the zest from each piece of fruit. Leave as much of the bitter pith–the spongy white stuff between the bright zest and the fruit–behind as possible. If you cut a piece of zest off with much pith attached to it, take the time to lay the piece of zest flat on the cutting surface and scrape the pith off. Gather the strips of zest into manageable piles of 5 to 10 and chop the zest. If you like chunky marmalade, cut the pieces bite-size. For a more spreadable consistency, cut the zest into ribbon-like strips. Some marmalade recipes have you just juice the fruit, but we like to cut the pith off the orange or grapefruit sections and separate from the membranes and include whole fruit pieces in the marmalade. To do this, first, you need to cut the ends from the fruits – being sure to cut away enough of each end to expose the fruit underneath the white pith. Working with one orange or grapefruit at a time, set a fruit on its cut end and use a sharp knife to cut off the white pith from the outside. Be aggressive—you really don't want any of the pith left on the fruit, it really is terribly bitter. Working over a large bowl to catch the juices that will inevitably dribble down your hand, hold the peeled orange or grapefruit in one hand and use a sharp paring knife to cut the sections out, letting the sections drop into the bowl below. This peel- and membrane-free sections are also called "supremes." When you come across seeds, pick them out and set them aside – you'll actually use them later! 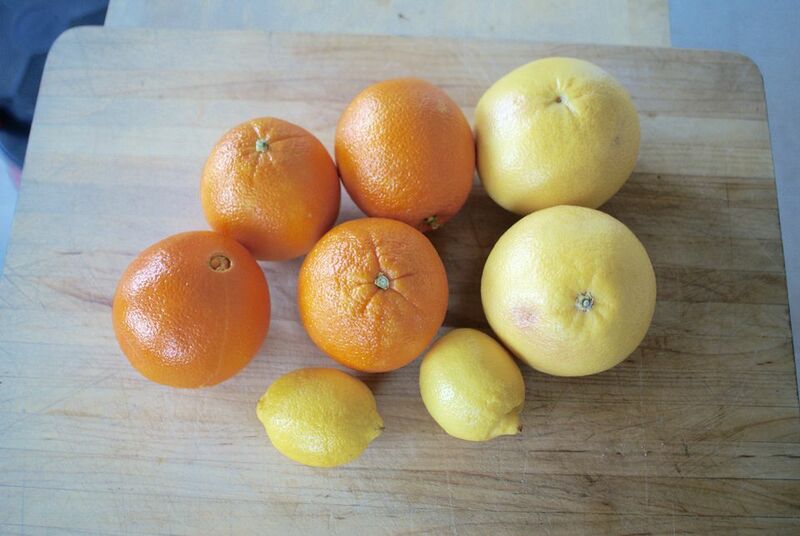 For more specific instructions, check out how to section citrus fruit. Once you've cut the sections out of each fruit, you'll be left with a handful of the membrane that separates citrus sections. It may surprise you, but you'll be using these, so don't throw them away. Before you set it aside, though, squeeze as much of the juice out of it, into the bowl with the sections or "supremes," as you can. This isn't so much a step, as a check-in. At this point, you should have a pile of chopped zest, a bunch of orange and/or grapefruit sections that are fully peeled, a group of squeezed-out membranes and seeds, and a pile of pith (this past group can be thrown away). Put the zest, fruit and accumulated juices, 4 cups of water, and 6 cups of sugar into a large, heavy pot. Stir to dissolve the sugar a bit and bring everything to a boil. If you plan to hot-water process the jars of marmalade, fill a canning kettle with water and bring it to a boil. Note that you don't have to process the jars, they will keep just fine in a fridge. Processing will allow you to store the jars in a cupboard instead of the fridge. It may seem weird that we've had you set the icky membranes and bitter seeds aside, but these parts of citrus contain pectin, which is a natural thickener and is what will "set" the marmalade. You can use a pre-made "jelly bag" of muslin, but we like to simply put the membranes and seeds in a double-layer of cheesecloth. Lay a large double-layer of cheesecloth in a medium bowl and add the membranes and seeds on top. Tie the ends of the cheesecloth together so the membranes and seeds are held inside to make a "pectin bag." Add the "pectin bag" to the zest, fruit, juice, and sugar already cooking. Put a few plates in the freezer—you'll use them to test the marmalade later. For the final marmalade to set, it needs to be brought up to 220F and held at that temperature for at least 5 minutes. A candy thermometer is very helpful with this, but not necessary. It is totally possible to make marmalade without one, however, you'll just need to do a lot more of the "set tests" in the next step. 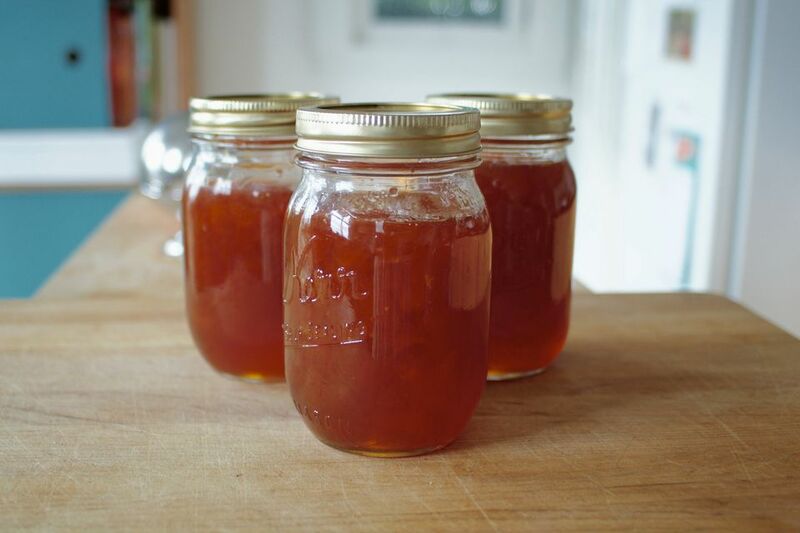 If you plan to hot-water process the marmalade at the end, use this time to sterilize the jars and lids by submerging them in the boiling water in the canning kettle for 10 minutes. After the marmalade has reached 220 F and stayed there for 5 minutes, do a "set test" by dropping a dollop of the mixture on one of the chilled plates you set in the freezer earlier. Let it sit for a minute, swirl the plate to spread the marmalade, then drag your finger through the mixture—" ​set" marmalade will leave a clean track behind it. Remove the cheesecloth pectin bag from the marmalade—use a large spoon to press the bag against the side of the pot to get as much of the marmalade out of the bag as possible. Discard cheesecloth bag and its contents. Remove pot from heat and let marmalade mixture sit for about 5 minutes before transferring it to jars. Give the marmalade a good stir to distribute the pieces of zest throughout the mixture. Use a clean ladle to transfer the marmalade to jars, leaving about 1/2 inch of headspace at the top. This recipe makes almost exactly 3 pints - put any extra in a small jar or bowl to cover and keep in the fridge (it isn't safe to process jars that aren't fairly full). Put lids on jars. If canning, use a jar rack if you have one, to lower the filled jars into the boiling water in the canning kettle. Make sure there is at least an inch of water over the jars. Boil for ten minutes, lift jars out of the water and let cool. Marmalade will keep, in a cool but dry dark place for up to a year. Once opened, keep jars in the fridge. If not canning, let jars cool to room temperature before putting them in the fridge. There are plenty of delicious ways to use marmalade, but our favorite is to spread it on these homemade buttermilk scones.